Achieving pec development like Schwarzenegger in his prime is a bodybuilding dream for most. But for Brett Azar, it was his job! Here's how he did it. You want to talk pressure? Try being the body double for a young Arnold Schwarzenegger, the most iconic physique of all time, in the latest installment of an iconic movie franchise. That's the daunting challenge actor, stuntman, and SciVation athlete Brett Azar faced on the movie set of 2015's $440-million-grossing Terminator Genisys, in which Schwarzenegger famously returned to the role that first made him the world's most beloved action star. The character, dubbed "Young Terminator" in the credits, was a CGI-enhanced Arnold from the neck up, but everything below was all Azar. Further upping the ante, Azar grew up idolizing Arnold more than most. "My grandfather raised me on Arnold movies," he says. "I saw Predator first. Then Terminator, Commando, True Lies, Eraser … I didn't have a father growing up, but Arnold was like the father figure. I saw him and said, 'I'm going to be that.'" Azar proved up to the task, however, when he created a sculpted, muscular figure armored with pecs that were up to the task of any flashback to prime Arnold. His secret? 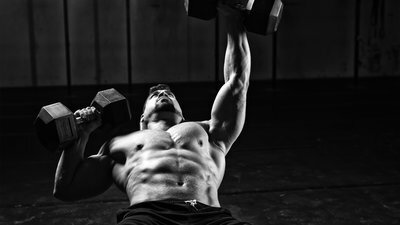 A vicious, badass chest workout. Here, in his own words, the 30-year-old walks us through the brutal regimen, rep by rep.
"To start, I put on lifting straps and I'll hang from a pull-up bar. I'll hang there for 30 seconds, bring my head all the way back and forward, and hopefully hear a couple of pops in my back. Then I'll twist to the right and bring my right knee upward, then twist to the left and bring my left knee up, and try to crack my back more. I'll do that whole process twice." "When my goal is going old school, I'll start with the flat bench. That exercise will take the most out of me, and so I want to make sure I hit it first. I'll start with just the bar for 20 reps, then I'll put on one plate per side and rep it out, doing a series of half and full reps, maybe 15-20 total. "Then I'll do two plates per side for two sets of 10 reps, then 1-2 sets of 6-8 reps with three plates, and 2-3 reps with four plates per side. I try to get 2-3 sets of those, and then I'll drop back down to three plates for 2-3 more sets of 4-5 reps each. On each rep, I take a grip just outside shoulder width, and I make sure to touch the bar down to my pecs for a full range of motion." "On inclines, I'll start with a lighter weight so that I can do more of a fly motion, really stretch out the pecs after the flat bench. I grab 60s and do 15-20 reps with more of a fly, then move up to the 80s. I'm looking for 8 reps there, and as I fatigue I start doing presses. Then I'll move on to 105 or 110—never 100s, I can't bring myself to use the 100-pounders because in my mind I always want that little extra. "At 105 or 110, I'm pressing 1-2 sets of 6-8. If I feel really good, I'll go up to the 125s or 130s and try for 1-2 reps, then do a triple dropset from there, going down right away to 85s for 5-6 reps and then to the 60s, returning to the fly motion and going till failure. I'll usually do that triple drop twice, but the second time around I'll start with the 105s, not the 125s. "I'll start standing between two high cable pulleys, holding the D-handles. The first set or two is lighter, for 12-15 reps. Then, as it gets heavier, I'll get down and kneel on the floor. This helps me get a lot more focus on the chest, and helps eliminate the ability to cheat. After 2-3 heavy sets on my knees, I'll stand back up and go lighter for 1-2 more sets, pumping it out." "For dips, I'm using the bars, leaning my torso forward. The stretch is the most important part to me, so I'll get all the way down as deep as possible, basically bottom out. I'm not getting a lot of reps here because going down into that deep stretch and controlling it really takes so much out of me. I'm lucky to get 8 or 10. "If I hit failure, I'll let my feet touch down and push off to get to the top of the rep, and then just do slow negatives until I hit at least 10-12 total reps in the set. Altogether, I'll do 4-5 sets of that and my chest workout is done." Admittedly, the workout as described here is not meant as a normal assault, but rather as a special occasion. Such an annihilation requires a high level of energy and strength, meaning you need to continually read the signs your body gives you, and prepare yourself for to be in the gym for a while. A solid pre-workout and BCAAs for lasting energy are no-brainers. "If something doesn't feel good today, then I'm not doing it," Azar says. "It's not about ego lifting anymore, it's about building size and strength while avoiding injury. What I do depends on how sore I am, or how my shoulders feel. The workout here I'll do when I feel amazing, and I've eaten well the day before so I have plenty of energy. When everything sets up like that, I go in knowing I'm going to kill this."